Globular clusters are very massive assemblies of stars. More than 100 are known in the Milky Way galaxy and most of them harbour several million stars. They are very dense - at their centers, the typical distance between individual stars is comparable to the size of the Solar System, or 100 to 1000 times closer than the corresponding distances between stars in the solar neighborhood. Globular clusters are among the oldest objects known , with estimated ages of 11 to 15 billion years . All stars in a globular cluster were formed at nearly the same moment, and from the same parent cloud of gas and dust. The original chemical composition of all stars is therefore the same. But now, an international group of astronomers , working with the UVES Spectrograph at the ESO Very Large Telescope (VLT), have obtained some unexpected results during a detailed analysis of dwarf stars in some globular clusters . Such stars have about the same mass as our Sun and like it, they evolve very slowly. Thus they still ought to have about the same abundances of most chemical elements. Nevertheless, the astronomers found large abundance variations from star to star, especially for the common elements Oxygen, Sodium, Magnesium and Aluminium. This phenomenon has never been seen in such stars before . It appears that those stars must somehow have received "burnt" stellar material from more massive stars that died many billion years ago. In their final phase - as "planetary nebulae" - they eject stellar material that has been enriched with certain chemical elements which were produced by the nuclear processes in their interiors during their active life. Such an acquisition of material from other stars has been proposed but has never before been seen in globular clusters. This new discovery obviously sets stars in globular cluster apart from those in less dense environments, like the solar neighbourhood. Globular clusters are very massive and extremely dense agglomerates of stars: typical distances between stars at their centres are comparable to the size of the Solar System. They were formed very early in the Universe and have very low metal content, down to about 1/200 of the Solar abundance. They are among the oldest objects for which relatively accurate ages can be determined for individual stars by means of their observed colours (for information about the "radioactive" method, see ESO Press Release eso0106. The study of globular clusters therefore plays a basic role in our understanding of the evolution of the Universe and of our own Galaxy. The globular clusters are quite distant and most are located in the Milky Way halo, far above or below the main plane of this galaxy. The nearest globular cluster is Messier 4 (NGC 6121), about 7,000 light-years away. The globular cluster NGC 6752, shown in ESO Press Photo eso0107, is a typical representative of this class of celestial objects. Its distance is estimated at 13,000 light-years. The vast majority of stars in globular clusters are "dwarfs" like our own Sun. They burn Hydrogen into Helium in their central regions, and like the Sun they spend billions of years in this particular evolutionary phase. When their light is dispersed with a spectrograph, thousands of narrow spectral lines are revealed that are caused by chemical elements like Iron, Sodium, Oxygen, Magnesium and Lithium, present in the outer atmospheres of these stars. "Spectral analysis" is one of the basic tools of astronomy, during which the accurate chemical composition of a star is determined by means of a detailed study of the lines seen in its spectrum. In this context, very detailed observations of dwarf stars in globular clusters are of great importance. They allow to compare directly the properties of stars in distant clusters with those of much closer - and hence more easily observable - similar stars in the solar neighbourhood. Such a comparison contributes to reducing current uncertainties in the determination of distances and ages of the globular clusters. Studies like these will ultimately yield a better determination of the age of our own Galaxy and the Universe, as well as the universal distance scale. 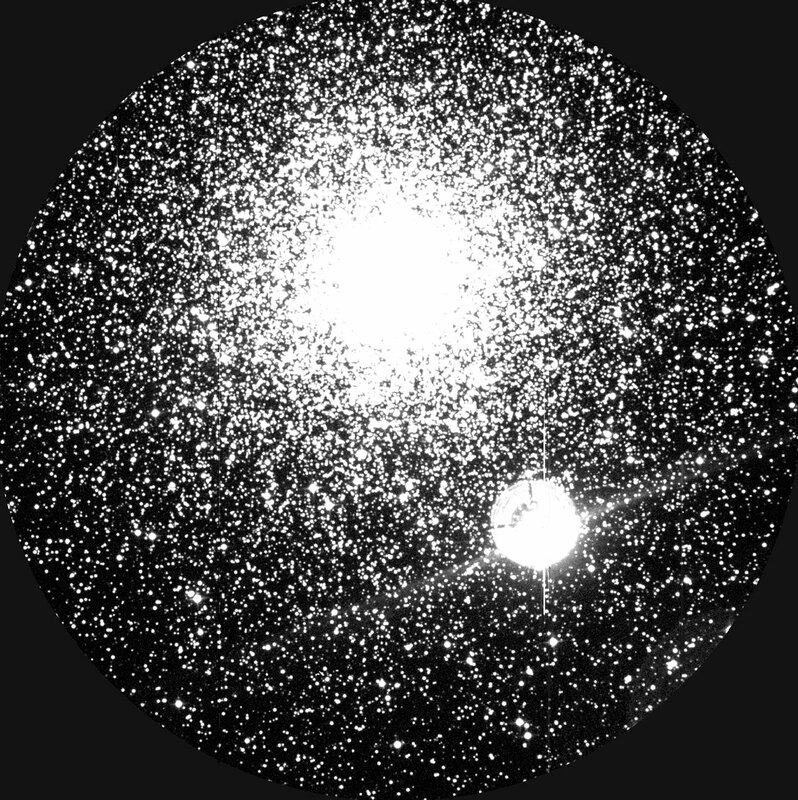 Detailed observations of dwarf stars in globular clusters are rather difficult because they are quite faint objects; The brightest are at least 10,000 times fainter than the dimmest stars observable with the unaided eye. 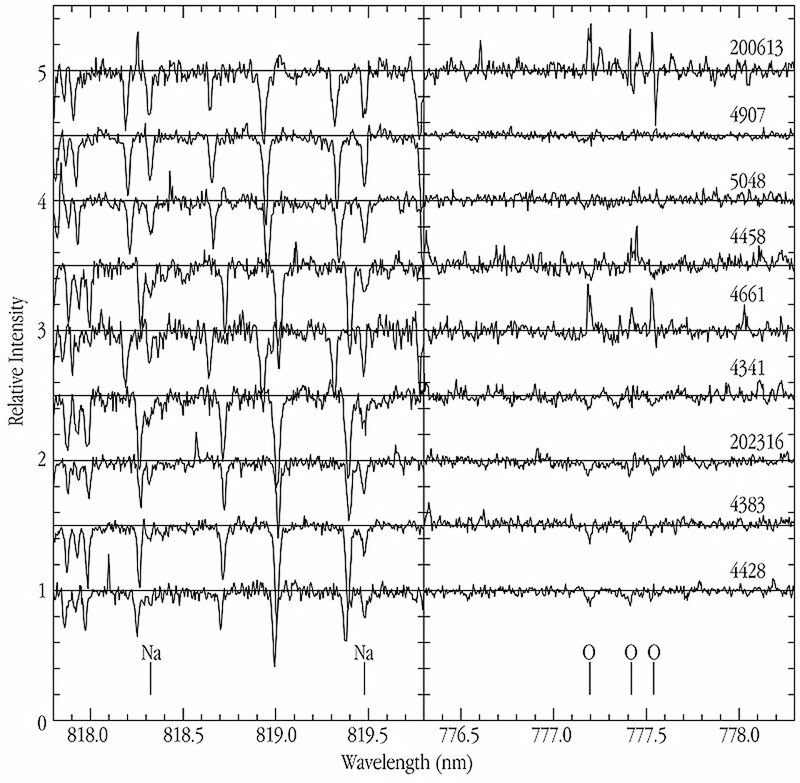 Nevertheless, the closest globular clusters are seen in the southern sky and with the high efficiency of the UVES spectrograph mounted at the KUEYEN 8.2-m telescope at Paranal (Chile), it has now become possible for the first time to obtain excellent spectra for a significant number of dwarf stars in globular clusters. The UVES spectra cover a wide wavelength interval (350 - 900 nm) and display a very large number of spectral lines that originate from many different elements. The first results obtained from the excellent data for this observational programme immediately brought a great surprise to Raffaele Gratton and his co-investigators. 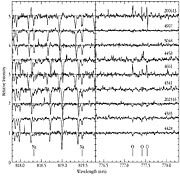 The Italian astronomer reports that "our detailed analysis revealed that, while heavy elements like Iron display an impressively similar abundance in all of the observed dwarf stars, other elements, such as Oxygen, Sodium, Magnesium and Aluminium show large abundance variations from star to star". Moreover, "these variations are apparently not completely random, as there is evidence that certain elements change in a similar pattern from star to star". This result is indeed unexpected, since the dwarf stars in globular clusters originated from the same interstellar material. Which effect may therefore produce the observed variations? And why are such variations not observed in dwarf stars in the solar neighborhood? The scientists think they have the answer. It has been known since the early 1970's that large star-to-star variations in the abundances of light elements like Carbon, Nitrogen, Oxygen, Sodium, Magnesium and Aluminium may occur in giant stars. Contrary to dwarf stars that still burn Hydrogen at their centres into Helium, giant stars have exhausted their Hydrogen supplies and have become much more luminous. Most investigators attributed the observed variations to the fact that in giant stars a certain amount of "mixing" occurs between the upper atmospheric layers (that emit the light we see) and the deeper (warmer) layers, in which some nuclear burning is going on, transforming Carbon into Nitrogen, etc. However, it is a well established fact of stellar evolution theory that such mixing and, consequently, the presence of abundance anomalies in the upper atmosphere can only occur in bright, evolved giant stars. It does not happen in dwarf stars, because the central temperature of those objects is not high enough to burn Oxygen or Magnesium, and to produce Sodium and Aluminium. It seems therefore not possible that the abundance anomalies are produced in those stars where they are observed. They should have been produced elsewhere, and transported in some way to the surface layers of the stars where we observe them . ESO astronomer Luca Pasquini from the team explains that "we therefore believe that these observations provide evidence that a certain fraction of stars in some globular cluster has received "burnt" material from more massive stars." He adds that "the stars of that elder generation ended their active lifetimes a long time ago by ejecting their material into surrounding space during a "planetary nebula" phase and have now become very dim "white dwarf stars" . The acquisition of material from other stars is a phenomenon that is apparently unique to globular clusters (except that it has also been observed in a few close binary stars). It clearly distinguishes stars in globular cluster from those found in less dense environments, like the solar neighborhood. 1 billion = 1,000 million. The team members in the ESO Large Program 165-L0263 devoted to the analysis of globular cluster dwarf stars, described in this Press Release, are: Raffaele Gratton (PI), Eugenio Carretta, Riccardo Claudi, Silvano Desidera, Sara Lucatello (Osservatorio Astronomico di Padova, Italy), Gisella Clementini, Angela Bragaglia (Osservatorio Astronomico di Bologna, Italy), Paolo Molaro, Piercarlo Bonifacio, Miriam Centurion (Osservatorio Astronomico di Trieste, Italy), Francesca D' Antona (Osservatorio Astronomico di Roma, Italy), Vittorio Castellani (Universita' di Pisa, Italy), Alessandro Chieffi (CNR-IAS, Italy), Oscar Straniero (Osservatorio di Teramo, Italy), Luca Pasquini, Patrick Francois (ESO), Francois Spite, Monique Spite (Observatoire de Meudon, France), Chris Sneden (University of Texas at Austin, USA), Frank Grundahl (University of Aarhus, Denmark). While it is apparent that some mass is transferred from the Planetary Nebulae to the stars, the details of this process are not clear. It may have happened before the stars here observed were formed, or later. In the latter case, the accretion may have occurred only during a particular evolutionary phase, some 100 million years after the cluster formed, i.e. about 11 to 15 billion years ago, and in very dense environments. Moreover, the accretion rate will depend on the relative velocities: only stars that move slowly with respect to the interstellar medium has a good chance of accreting matter. This may also be (part of) an explanation of the observed, large differences from star to star. A photo of a large planetary nebula is available as PR Photo 38a/98 and information about VLT observations of white dwarf stars in globular clusters are described in PR 20/99. The research paper ("The O-Na and Mg-Al Anticorrelations in Turn-Off and early Subgiants in Globular Clusters") on which this Press Release is based is now in press in the European journal Astronomy & Astrophysics. It is also available on the web as astro-ph/0012457. ESO Press Photo eso0107 The image has been obtained through a v-band filter with the DFOSC multi-mode instrument the Danish 1.5-m Telescope at the ESO La Silla Observatory (Chile). 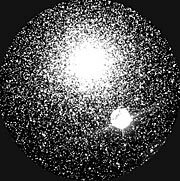 The diameter of the field-of-view is 9 arcmin; the exposure time was 10 min, and the seeing was 1.3 arcsec. A few CCD columns suffer from imaging defects.